StrawBerry Bridge has an excellent selection of mobile homes for sale. 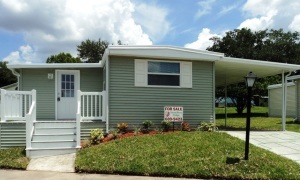 In fact, our selection of mobile homes is arguably one of the best in the Tampa Bay area. Our community, which is restricted to individuals who are 55 years of age or older*, recently has remodeled a select number of homes on our 150-acre property. These newly renovated homes have all been freshly updated using visually appealing, low maintenance products and materials. The great thing about purchasing one of our recently renovated homes is that your time won’t be monopolized by home maintenance chores. Instead, you will be able to focus on the things that you moved to StrawBerry Ridge to enjoy, and to lead an active retirement lifestyle that is full of invigorating activities. Our 55+ community, which is located on Florida State Road 60 E just a short drive away from downtown Tampa, is designed to cater to retirees who want to live in an affordably priced community that has a variety of resort-style amenities onsite. Relax – Whether it’s going for a dip in one of our two pools, peddling around the community on a leisurely bike ride, or reading a book from our community library, there are many ways to relax at StrawBerry Ridge. Stay fit – With two swimming pools, a fitness center, an aerobics room, tennis courts, and pickleball courts, we offer various ways to stay fit. Have fun – There is never a shortage of fun things going on at StrawBerry Ridge. Activities that are popular among our residents include Bridge, Mah Jongg, shuffleboard, ping pong, and billiards. Try new things – Retirement is the perfect time to develop new hobbies and interests. At StrawBerry Ridge, you can try your hand at woodworking, arts and crafts, computer club, and volunteering. Our residents are always up to something interesting. For more information about StrawBerry Ridge and our current inventory of mobile homes for sale, contact us today. We are one of the premier age-restricted retirement communities in the Tampa, FL, area. *One resident in at least 80 percent of the households must be 55 years or older. No one under the age of 18 may be in permanent residence.